Sonet Satin Brass Ceiling Fan with Walnut Blades, 52"
Stripped free of decorative embellishments and extraneous detail, the Sonnet beautifully expresses the art of the ceiling fan at its most basic and elemental. The sleek Satin Brass housing accommodates the extraordinary walnut blades and LED lighting. 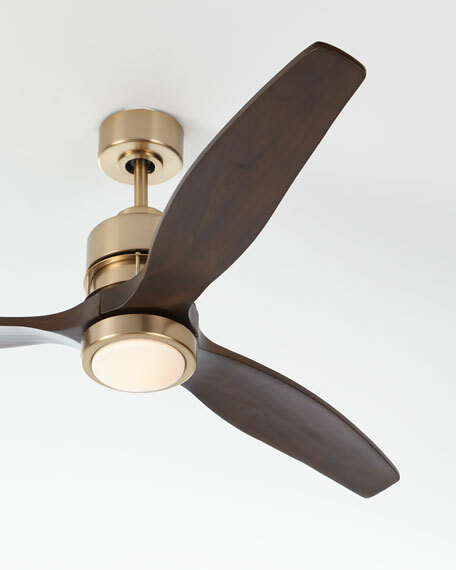 Ceiling fan featuring walnut-finish wood blades and steel frame. Dual remotes controls with a calm shell cover to convert one of the wall remotes to a hand held transmitter. The Integral light kit uses 14 watt LED light source with a lumen output of 1,380 lumensan equivalent to a 100 watt incandescent light bulb. Powered by a six speed energy efficient DC motor.